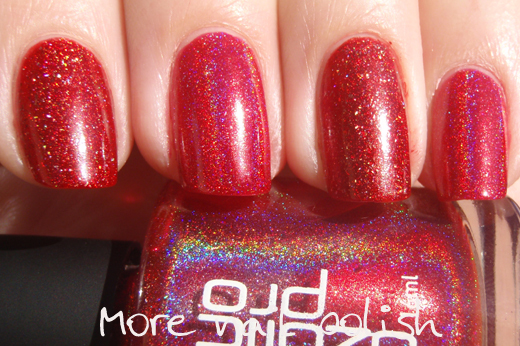 As promised ladies, here is Ozotic 621. This is the scattered red holographic. 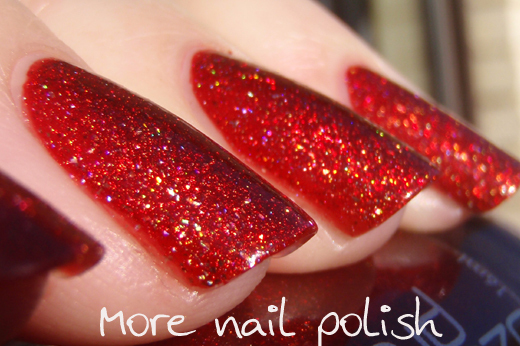 This polish is a much bluer red, and certainly more of a true red compared to 518. But it's holographic effect is very scattered and difficult to catch with the camera. In fact it's also a little difficult to catch with the eye. It certainly is very pretty and sparkly, but as far as the holographic rainbow goes, it gets a little lost within the deepness of the red jelly base. This was three coats, because I noticed a bald spot which only had the jelly base colour and no sparkly bits on it. No top coat. And just for you Claire - here is a side by side comparison of 521 with 518. As you can see, 518 (on the left) is more of a strawberry pink red. 521 is a richer squishier red jelly. I personally think the holo effect in 518 can't be beat because you can actually see the rainbow effect. WOW! That is friggin gorgeous! I love how red it is and is also a holo.. I need it! love love love them both! Thanks mate!! :D Yeah I'll need that in my collection *itches to buy it now* Onto the Wishlist it goes! OMG I have never seen a red with anything like that in it before! That is so gorgeous! So pretty! I want them both. 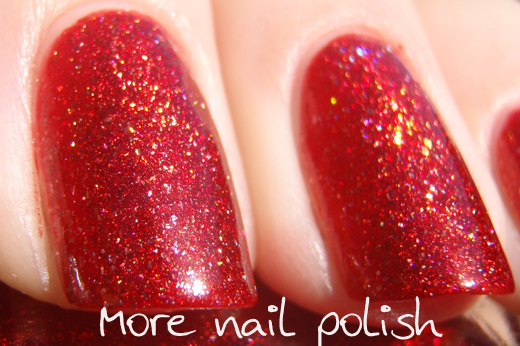 I have never seen red holos...I am totally drooling...those rich colored holos are amazing! I love them both!! WOWZERS!! 528 is ok, I can't wait to see it over black. :) You really make beautiful photos! Thanks for posting this, I was trying to figure out which ozotic red to buy first up. Decision made!